Go Visit Great Sand Dunes National Park Now! It's no secret how much I love Great Sand Dunes National Park and Preserve, in my opinion it's the most beautiful national park in Colorado. It is certainly the most unique experience! While I love how the sand dunes look and being flanked by the Sangre de Cristo mountain range only stands as an example of why it's the most beautiful national park, I will freely admit that there's not much to do at the sand dunes. So why is it the most beautiful? As a photographer, it's a veritable playground for photographers like me who love seeing the textures of the dunes, the layers, and the shadows at sunset are otherworldly. Here's three of my favorite photography reasons to go book your trip to Great Sand Dunes National Park right now. With the tallest sand dunes in the North America, you simply won't find taller sand dunes and they are majestic to gaze upon. The tallest dune, Star Dune, rises almost 800ft. from the valley floor! It's surprisingly difficult to climb despite being only 800ft. tall, the sand makes that trek take much, much longer than it should. It sounds crazy but the sand dunes are just like what you would imagine, except they are nowhere near an ocean. There is a creek named Medano Creek that serves as a boundary for the sand dunes and actually what allows the tall dunes to form in the first place. Hiking to the top of Star Dune will give you a surreal view of the dune field which looks like waves of sand that are crashing up agains the mountains. In fact, that was what early explorers said about the sand dunes that they likened them to waves on the ocean. 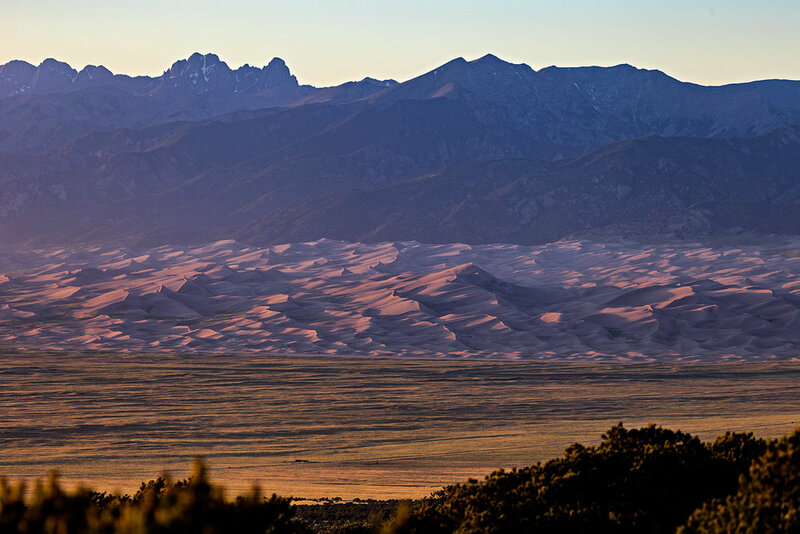 You'll be rewarded with stunning views if you hike up the dunes and get on top of a ridge, the Sangre de Cristo mountains and the dunes are particularly beautiful at sunset. One of the biggest reasons why I continually go back to Great Sand Dunes National Park is because I'm in love with the landscape there, it fascinates me beyond many others in part because it's always changing. I grew up in Monte Vista, CO which is about 35 minutes away from the dunes and we'd go there frequently but they were short trips because there isn't much to do at the dunes if you're not doing photography. There's hiking the dunes or playing in the water, sightseeing, and that is about it. During the summer, sand temperatures can reach 140 degrees and it's awful being on the dunes at that point, so you go cool off in the creek. And that's about all there is to do, this isn't one of those national parks like Yosemite, Glacier, or Rocky Mountain where you have endless hiking trails with scenic vistas. With Great Sand Dunes NP, what you see is what you get. Except when it comes to photography. Because of the ever-present San Luis Valley wind, there is always sand moving and shifting and changing the landscape ever so slightly. This always creates new and different opportunities to shoot pictures, or you can grab a telephoto lens and shoot from the flats before you reach the dunes, or you can hike to the top of the dunes and get a shot of the mountains behind with waves of sand in the foreground, or you can shoot abstract lines/shadows and create unusual compositions that way. I'm constantly shooting panoramas when I'm at Great Sand Dunes National Park because the landscape is so immense that it's difficult to capture it in one frame. Plus, if you shoot from near the entrance of the park toward Star Dune you'll see two 14ers in the background (Crestone Peak and Kit Carson Peak). This is why I love the landscape so much, because there are so many options for what you want to shoot. Juxtaposition shots at the dunes are incredibly fun too, framing something that looks tiny compared to the immensity of the dunes always makes for a great shot! Here are some examples of the different compositions and framing opportunities there are for photographers at the dunes. 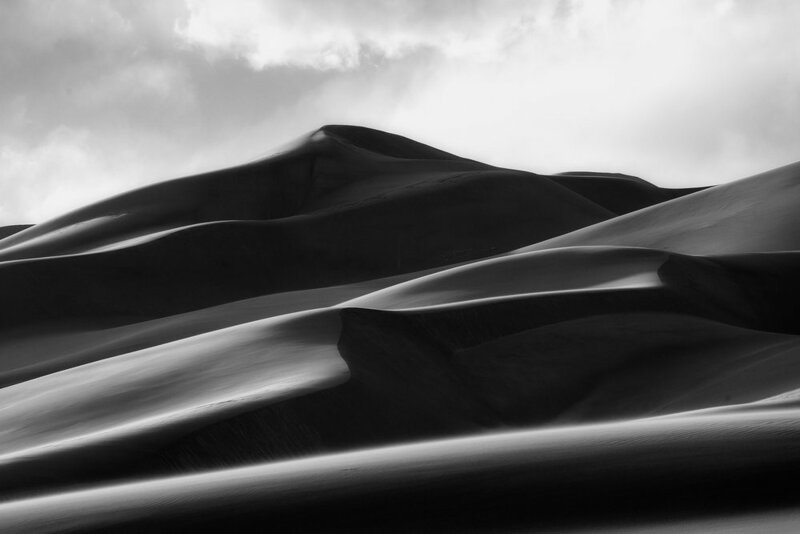 So I've mentioned by now that I think that Great Sand Dunes National Park is the most beautiful for photography and I have mentioned on this blog before that "bad weather usually makes for great photos", the Sand Dunes are home to some truly beautiful and horrendous weather. If you can imagine how the sand dunes were built up to be over 700ft. tall, you'd probably be able to guess that wind is a huge part in that building process. The San Luis Valley knows a thing or two about wind, and it's awful there; especially in the spring. Yes, the wind makes it hard to enjoy the dunes because you feel like your legs are in a sandblaster. For example, here's my friend Rick enjoying the wind at the dunes. The wind also usually brings along weather which is why I'm mentioning this to you, Great Sand Dunes National Park is truly beautiful in all kinds of different weather. Take for example the photo on the left provided by GSDNP's Instagram page. As you can see, when it snows at the dunes the landscape transforms into an otherworldly view, white replacing sand. I've witnessed this before and it's magical, I highly recommend being in the area when it snows. This should come as no surprise if you've seen the photos above, but the surrounding landscape of the mountains is spectacular! The jagged Sangre de Cristo mountains are beautiful any time of year and if you don't know where they got their name, stick around for sunset one evening. Here's an excerpt from the legend of how the Sangres got their name. Speaking of the Sangre de Cristo mountains, there is a waterfall named Zapata Falls that is at the base of the Sangre de Cristos not far from Great Sand Dunes National Park and well worth a visit to the shady waters, especially on a hot summer day. The hike to Zapata Falls is a very easy one, it's only about a half mile from the trailhead and there is minimal elevation gain however the falls elevation is well above 8,000ft. so take it easy if you're a flatlander out visiting. The falls themselves are hidden behind some rocks that after some scrambling, can be reached but due exercise caution because of all of the slick rocks. The nearby Zapata Ranch features over 1000 head of bison and was the home to a championship golf course back in the day, but conservation of bison was more important than the desires of golfers. I had fond memories of that golf course, having played there numerous times while in high school. When I was 15, I shot a 75 (4 over par) on that golf course, which at the time was the best score I had ever turned in. Now that ranch is a working horse and bison ranch as well as a corporate events center. The Sangres are one of my favorite mountain ranges, partially because I grew up looking at them daily and seeing Mt. Blanca rise above the San Luis Valley floor is a sigh to behold. These mountains hold so many photography opportunities that you could explore here daily and always find something new to shoot. While I haven't explored the Sangres personally very much, I got into photography long after I moved away from the San Luis Valley and I'm not familiar with the Sangres as much as I am the San Juan mountains. However, I do know that there are many high alpine lakes in the region that are beautiful in any light, but especially at sunset just like the dying words of that Spanish priest. The mountains truly do glow blood red some evenings and one of those sights that you should experience at least once in your lifetime.